László Hartmann was born in 1901. During his teens he tried his hands on various sports, like boxing and wrestling, but these were not exciting enough. So he turned his attention to cars. He „borrowed” the family's big Hupmobile tourer and appeared at the 1928 touring race organized by the Tisztántúl Automobile Club. This was followed by an entry to the international Monte Carlo Rally in 1929 and 1930. In 1929 he won an honorary medal as he was able to finish the race, despite an accident. At the end of the 19th century, motorized tricycles appeared as additional spectacles during bicycle races. In 1900 some automobiles were reported to participate at these events in a few Hungarian cities like Pécs or Szombathely. This was followed by a track race at the Budapest horse track, as part of the First International Autoshow in Budapest in 1901. Following a lull, the international Prince Henry Touring Race, initiated by Prussian Prince Henry, had one of its leg in Hungary during 1909. This prompted the Hungarian Automobile Club (from 1912 it also added the Royal title to its name) to organize cross-country touring races. These were basically long-distance automobile excursions with a bit of racing element added. The First World War interrupted these activities. After the war when the Monarchy was disbanded and Hungary lost most of its former territory, long-distance tours were out of the question, so the Royal Hungarian Automobile Club had to come up with new event ideas. And that's how they came up with a race up to the Schwaben Hill (Svábhegy in Hungarian). This was a picturesque part of Budapest where the first race was held in 1920. It was a great way to show new machinery and test one's abilities. 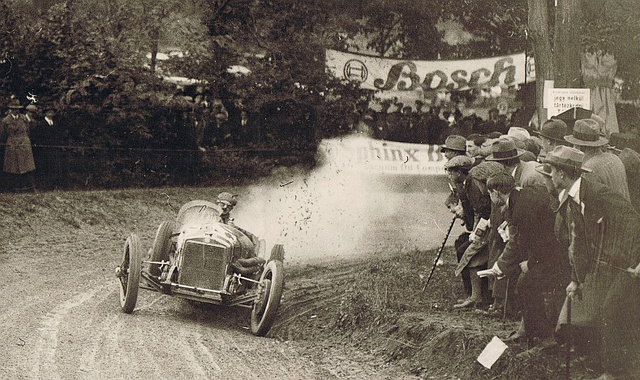 In the 20's other similar races sprung up, some touring events were held etc. 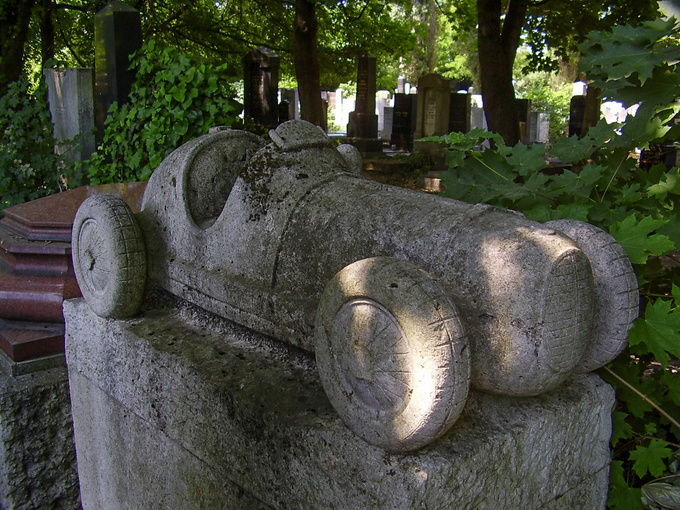 A new generation of racers emerged, including Walter Delmár, Pál Feledi and count Tivadar Zichy – these were rich enterpreneurs and aristocratic playboys. Some of them also participated in foreign races – Walter Delmár was a member of the Steyr racing team for a few years, but he focused more on touring cars and did not go into GP racing. Count Zichy appeared at some GP events in 1930-1931. But he was flat broke by then and had to resort to racing his friend's Bugatti. And then came László Hartmann and changed the game. The Hupmobile was big and was not a racing car. By then he was into real estates and the stock market and amassed a little fortune. So when count Tivadar Zichy went broke, his Bugatti was bought by Hartmann during Christmas, 1929. This was a T35B, a 2.3-litre, 140 PS car. A few days later he set up the first Hungarian speed record. He bought a smaller Bugatti soon afterwards. This enabled him to participate in two categories at the same event! In 1930-1931 he participated at various races in Hungary and abroad and honed his craft. During 1932 he got hold of an even faster and much newer Bugatti, a Type 51, which was previously owned by Hans Lewy, a renowned German racer. 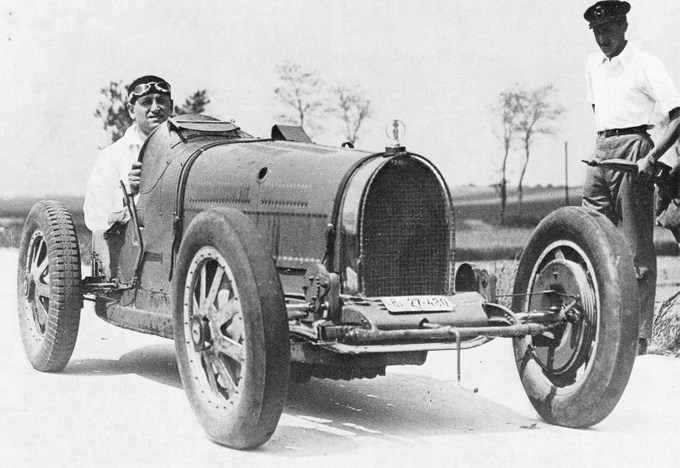 This Bugatti enabled him to join the elite rank of GP-racers. The first international GP championship was organised by the AIACR (the forerunner of FIA) in 1925. 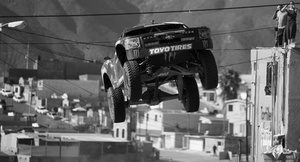 This series was mainly for racing teams, not for individual pilots. But it proved to be too expensive, so manufacturers left the series in 1927. From 1928 to 1934 there were a lot of different races and GP events all over the world. GP racing, a forerunner of Formula-1 races, was quite different back then. Open-wheel racers and their drivers spent 4-6 hours on a track. At the 1932 German GP, for example, Hartmann finished second in his category by completing 23 laps in 5 hours, 7 minutes and 22 seconds! In 1934 AIACR reorganized the championship. They set up two categories: the „big” one where the engine size was unlimited, but weight was limited to 750 kg. And the „voiturette” category for cars with a maximum engine capacity of 1.5 litres. The „big” category was dominated by huge racing machines by Mercedes-Benz and Auto-Union, supported by Adolf Hitler. The „voiturette” category enabled Italian, French etc. manufacturers and private entrants to shine. 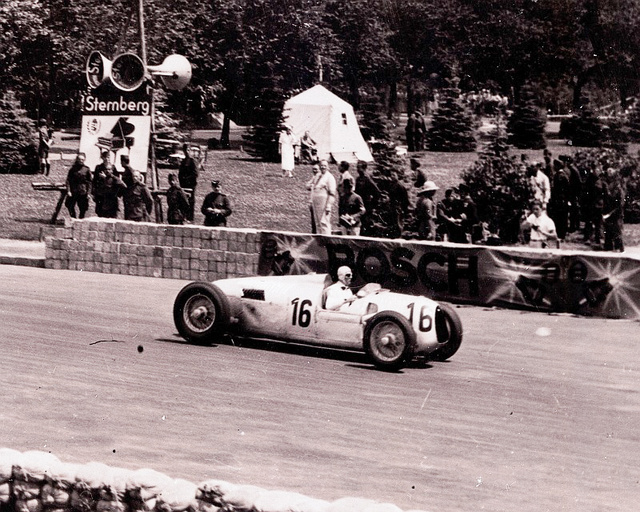 By this time Hartmann participated in 15-17 races a year – both in Hungary and abroad. He was awarded a Signum Laudis medal by governor Miklós Horthy in Hungary, while ADAC – the German automobile club – honored him with a golden medal, and his records attracted a cup from Malcolm Campbell. In 1934 he managed to secure a 180 PS, twin-cam, 1500 cc, 6-cylinder, double Weber carburettor-engined Maserati for the 1935 season which was lent to him by Maserati. This was a huge step-up from the various Bugatti cars he raced previously. With this Maserati, which was repainted in the Hungarian national colors he was third in the Comminges GP and won an international race in Felek, Romania. He also appeared at the Avus GP, Eifel, Chimany etc. He obviously made his mark as the Maserati team offered him a paid driver status for several races in 1936. Though Hartmann raced mostly abroad, he returned to Hungary from time to time and broke several speed records locally. In 1934 Hartmann was comissioned by the Royal Hungarian Automobile Club to conduct negotiations with AIACR on the possibility of a Grand Prix event in Hungary. 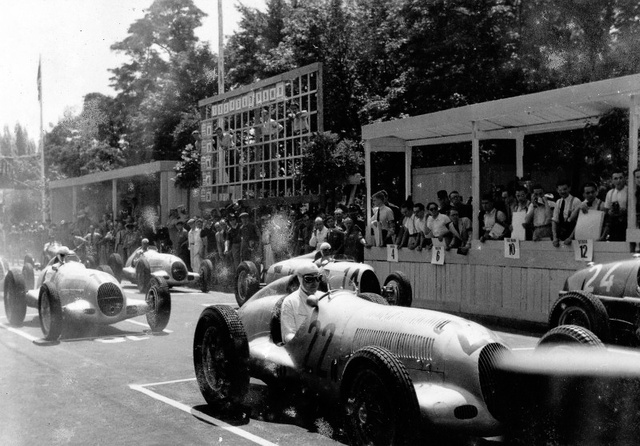 After many twists and turns the first and only Hungarian GP was held on 21 June, 1936 in Népliget. It was won by Tazio Nuvolari (Alfa Romeo) ahead of the Germans. Hartmann, who just returned from Eiffel GP barely had time to prepare, but finished the race with his Maserati in 7th place. 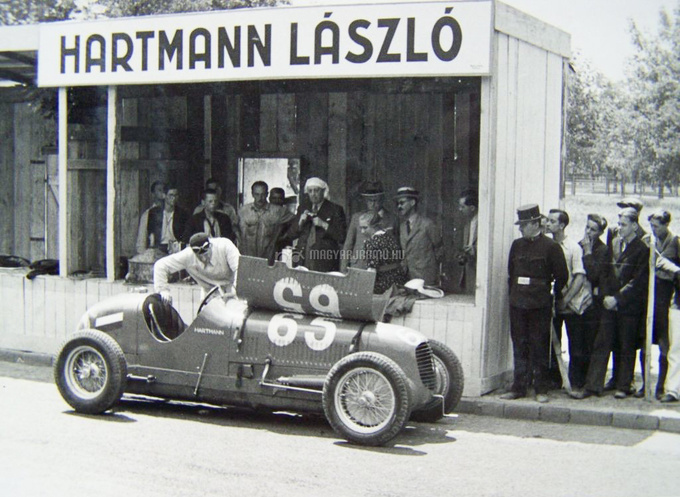 For the 1937 season, he got Tazio Nuvolari's Maserati 6C/34, which was again repainted to the Hungarian national colors. This was the first time Hartmann was enabled to race in the „big” category. At the German GP he finished sixth – he was only beaten by the mighty Silver Arrows from Mercedes-Benz and Auto Union. He was 10th at the Swiss Grand Prix and raced in both categories at the Masaryk Race in Brno where he finished 3rd and 7th respectively. He was a semi-official Maserati driver by then. In the race in Tripoli Farina found his progress hampered by the Maserati of László Hartmann and began lunging impatiently at him with the long nose of the Alfa. Eyewitnesses said that the contact between the cars looked deliberate, from which Hartmann’s car skidded and flipped over. The Hungarian was thrown out and broke his back, dying in hospital the next day, 16 May, 1938. László Hartmann was buried at the Kozma street Jewish cemetery. Unfortunately his tomb is neglected. Where have the pictures gone? His photo collection suffered a typical Hungarian fate: his widow, Mária Rahmer was forced to leave Hungary after the 2nd World War. She went to Paris, then to Canada. She kept his husband's photo album all along. In 1986 she was invited back to Hungary for the 1st Hungarian Formula-1 race. She brought the album and showed it around. A few rudimentary photocopies were made. Rahmer died in 1998 and it seems the album is now lost.